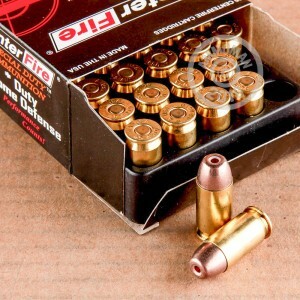 This 45 ACP cartridge from SinterFire’s Special Duty line of ammunition sports a 155 grain projectile. Rather than having a solid lead core, this round’s frangible bullet is made of compressed copper powder, which gives it a great many benefits. Its bullet will disintegrate when it hits a surface that is harder than itself, so you may fire this round indoors with far less risk to innocent bystanders, making it ideal for home defense. Its lead free design also means that this bullet is much less able to foul your pistol’s bore, and furthermore makes it suitable for use in areas where lead ammunition has been banned. It also won’t create lead gas when exposed to hot propellant gasses, making this round safer to fire at indoor ranges. 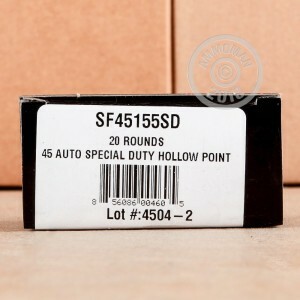 This round’s frangible bullet is a hollow point, so you can count on the kind of expansion to occur within targets that is ideal for personal protection. SinterFire makes 90% of the frangible bullets that are used in America, so you can trust their authority on this specialized type of projectile.